We’ve talked a lot about brands that refined their packaging to perfection, or kept the same look because, really, it was perfect already. But there are those special, brave brands that are willing to take their most identifiable packaging and really have some fun with it. In this case, it’s Kentucky Fried Chicken and their famous bucket shape. Since everyone knows just how good the KFC Bucket looks, let’s check out a few ways they’ve played around with unexpected uses of it. These examples are proof that they’ve created clever, memorable and, we daresay, iconic packaging. To celebrate its 60th anniversary in Canada, KFC created the limited-edition Memories Bucket. It features a built-in Bluetooth printer that you can connect to your phone and print off your favourite pictures. Since the bucket can bring everyone to the table, it’s an interesting (if unexpected way) to celebrate and bond with family. Who’s up for chicken selfies? Who needs cheese and bread when you’ve got gravy and popcorn chicken? Created as a Valentine’s Day promo, these buckets of gravy are heated by a candle, and billed as a way to enjoy a “romantic-ish” dinner with your partner. Made available online for pre-order, the first round sold out on their very first day—and proved so successful that you can still find them online. In a world full of cheesy things, this is literally not a cheesy promotion. 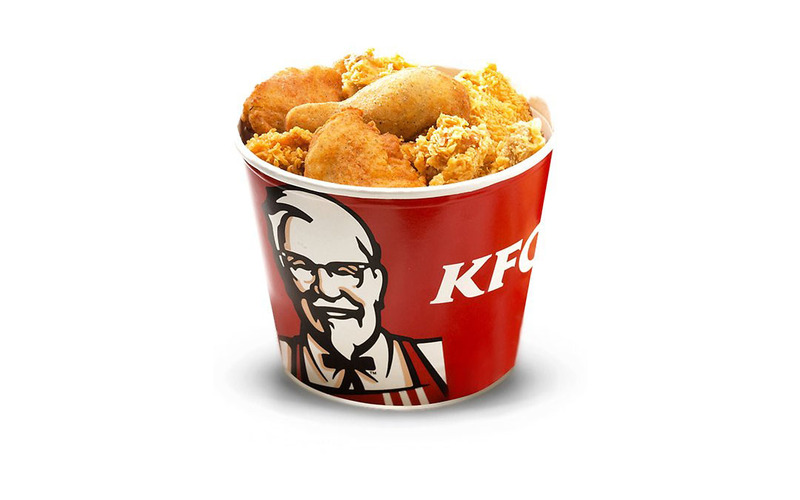 The “Suppertime Stories” bucket was created to promote KFC in South Africa. Merging packaging with mobile technology and a national love of storytelling, it’s a brilliant way to reinforce the bucket shape while giving families a reason to hang out once dinner is over. The ‘lampshade’ you see in the picture above is a specially-designed laser-cut sleeve that slides off the original bucket. The “Suppertime Stories” app is downloaded onto a smartphone, which is laid on a table, with the lampshade placed overtop it. The app then plays an audio story and emits light—which shines through the sleeve’s cutouts and onto the room’s walls. Building on their couples-based fondue bucket, ChickenGrams are heart-shaped KFC buckets that let lovers share a fried chicken dinner together. The underside of the lid also comes with one of 3 chicken-themed love poems, making for one cluck of a night. There are probably many more puns we could make here, so let’s just move on by saying that, if nothing else, this is seriously memorable. And, admittedly, hunger-inducing. New Zealand loves its rugby and its chicken. So, KFC set out to create a piece of packaging that recognized the fans’ adoration of both. The result? Super Rugby Helmets for the major competing teams. As a piece of packaging, it’s an interactive creation, doubling not only as a carrier of chicken but as a wearable piece of fan memorabilia. It was also a series of firsts. Not only had the bucket never been cut into before (requiring the creation of a special die), but the Super Rugby helmets needed a new printing process (each helmet pattern was printed individually instead of on large bulk sheets), and stadium regulations restricted advertising to remaining below a height of 1.2 metres (approximately 4 feet). Thankfully, an exception allowed wearable advertising, meaning the helmet buckets had the go-ahead. Visible at eye-level, they were an instant hit and the talk of the stadium. Clearly, there’s a ton of fun to be had with your brand’s packaging, all it takes is some lateral thinking and a good dose of bravery. That’s why The Packaging Company thinks the KFC Bucket is worthy of iconic packaging status. Be sure to tell us what packaging design you think is iconic. We’d love to share it here! Oh! Just because we love it so much—here’s an actual pool mattress in the shape of the Colonel. Created as a promotional giveaway, it has space for a drink in one of his hands and a bucket of chicken in the other. That’d be quite the weekend at the cottage (Think of the arguments over who gets to use it first! ).